Floralytes are a convenient choice for centerpieces that need a little illumination. Lights can draw attention to your finest décor. That’s why so many couples and event planners choose to light up the centerpiece on every guest table. Create a stunning display that will leave guests in awe with floralytes! Floralytes come in a number of beautiful colors. You can stick with plain white or choose a hue that will add glowing highlights to your décor. Find something that matches the color scheme. For example, blue or green might be better for a sea themed event while red or pink might be better for something with romantic flair. View all available colors to find the best shade for your personal taste and venue. Floralytes are intended to be used one time, so you don’t want to turn them on as soon as you receive them. Make sure you time them so they stay lit throughout the celebration. 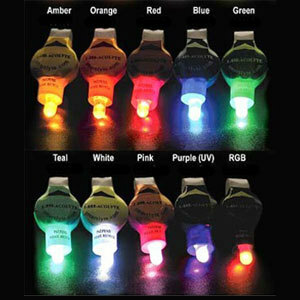 Each bulb will glow for between 36 and 48 hours in a dry display or 10 to 16 hours in an aquatic display. If you are decorating days before the event, you can still setup your Floralytes. Place each bulb where you want it or set it next to the centerpiece or decoration it is intended to be used in. Then have someone or a few people go around and turn on your Floralytes just before the festivities begin. Floralytes are appealing for one-time events because they are single use. Instead of adding more to your packing list after the event, you can just toss them in the trash. Make sure you separate them from other décor so the attached string doesn’t become tangled.